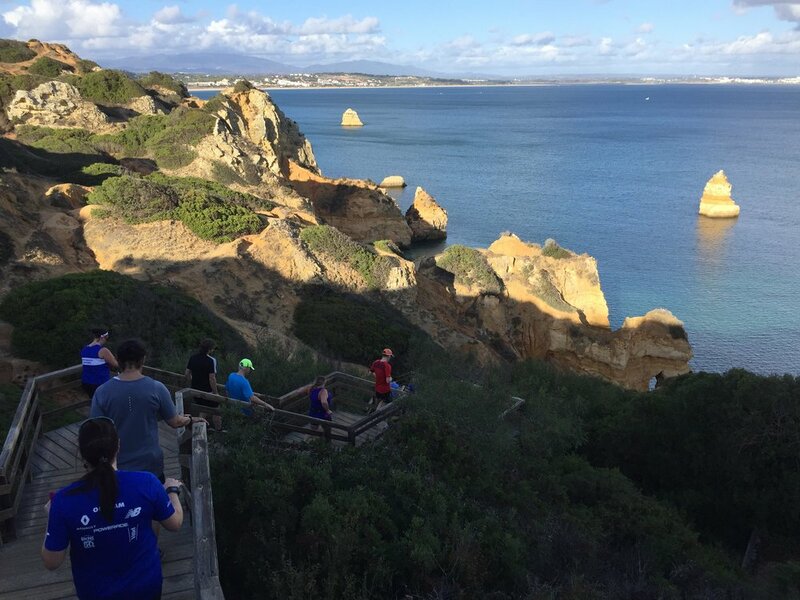 Two weeks ago I went down to Lagos in Portugal to coach at a running holiday with Embrace Sports. Matt, a fellow Run With Me runner, also came down for the trip. 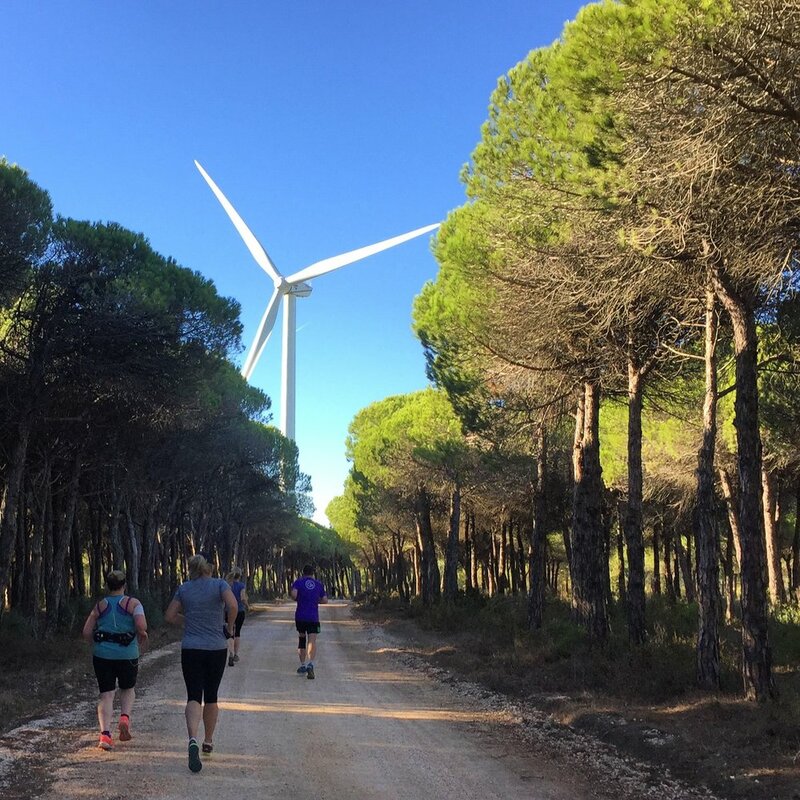 We wanted to experience an Embrace running holiday first hand, and see if there was potential for Run With Me and Embrace Sports to collaborate on trips like this going forward. I flew out of a cold Stockholm on Saturday excited for the week ahead. I would be meeting Neil Aitken, founder of Embrace, for the first time in person, as well as his team of coaches, and was hoping that I was going to be a good fit on the camp. I am used to leading groups of runners in Stockholm, both locally in our running group and visitors on tours, but this was foreign soil. Leaving the cold and flying south, always a good option in November! The first day I was met by Embrace Coach Mike at the airport, and after waiting for Michelle to arrive, we headed from Faro to Lagos, where we would be based for the week. I met Neil and the rest of the team and once we had settled in, we were off on our first run down to the lighthouse at the beach. We made it down to some stairs at a beach entrance, and although feeling a little sluggish, found the energy to run back up. The first night was the week briefing, introductions and a few drinks, at which time it became clear that many of the people on the holiday new each other from previous camps. There were many people returning, some of which had been on numerous of these holidays with Embrace across both Portugal and France. 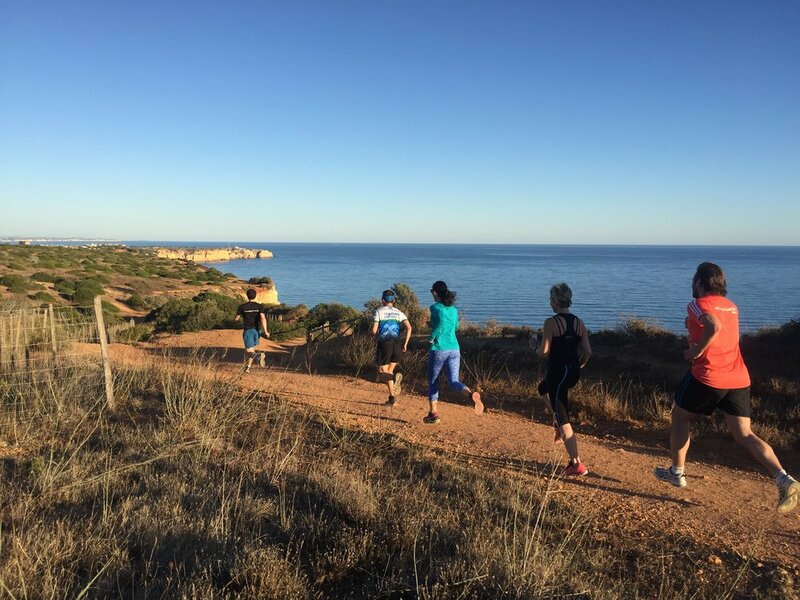 Sunday we were off to the beach for some mile repeats, and we had beautiful blue skies and 22 degrees for it! 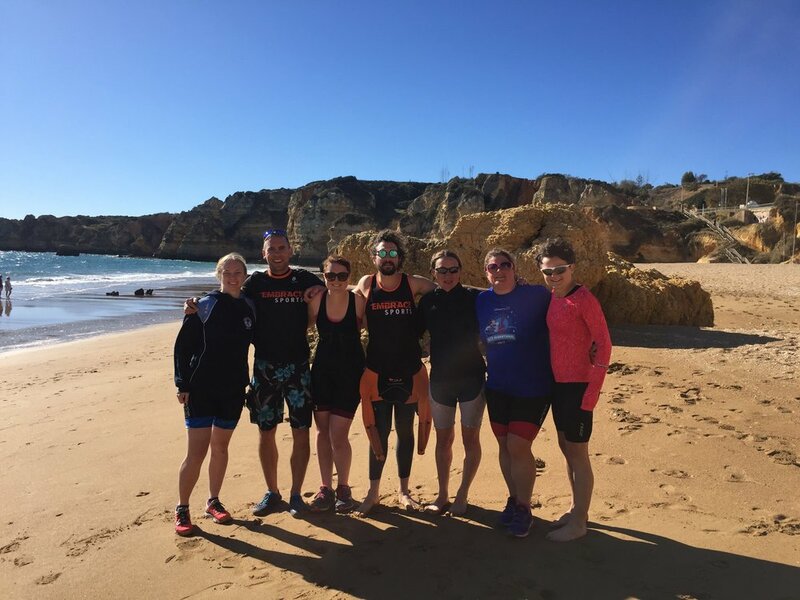 This camp was not just a running camp, it was also a triathlon camp, with Embrace running dual camps at certain times to cater for both type of athlete. 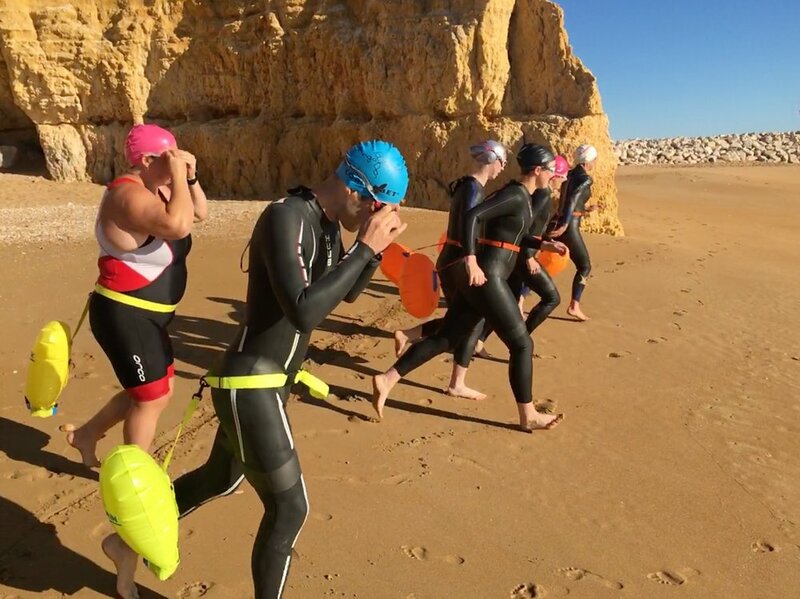 Although running is my strength, I am quite happy on a road bike and in the water, having tried my hand at triathlon, and so was happy to be invited on a ride with the triathletes that afternoon. As the week went on, I would move between the running and triathlete camp, helping out wherever needed. The next day we were off for a trail run, with people choosing between 8 / 16 / 24 kms. It was a fascinating landscape, with the trails set amongst massive wind turbines. I took a couple of laps around the 8 km course, trying to get to know a few people along the way. Back to the camp for lunch, then it was a swim with the triathletes and a recovery run to finish the day! No rest for the coaches though, most days it was all hands on deck in the kitchen with my role being chief cutter of vegetables. The food was incredible the whole week, and it is no small task cooking for 27 people after the intensity of the training that you go through every day. After the day before you'd think it might be time for an easier day, but instead it was off to the local track. This could have been an opportunity to sit back, but I usually have a hard time doing that, and it's great to get involved and go through what everyone else is (pain). So I put my hand up to run with James, who was seriously quick. Mike had set us 5 x 400 m / 200 m / 200 m with 1 minute rest between each and 3 minutes rest between each set, run at about our 5 km pace. I took a convenient time out after 4 sets and recorded videos from the side so people could see their running techniques back at camp. The next day was probably my favourite, a duathlon for the triathletes and a 9 km run for the runners, which they called hell on the hills. I did the duathlon, which is the first time I have ever done a duathlon, and loved it, despite the fact that my body was crying out for a rest. It was a 3 km run, 9 km cycle, and then 3 km run, basically just up and down 2 massive hills. That equated to 55 odd minutes of high heart rate intense training. At this point you are probably thinking this all sounds quite intense, and it is, but you also spend hours in between relaxing (at least if you are not a coach) in the sun and eating, which makes recovery faster. What doesn't make recovery faster is getting on the beers and wine every night, which is also a standard part of the daily routine on an Embrace training holiday. With top regional table wine coming out for free every night, and cost price beer on tap (which in Portugal feels basically free), it is hard to say no. 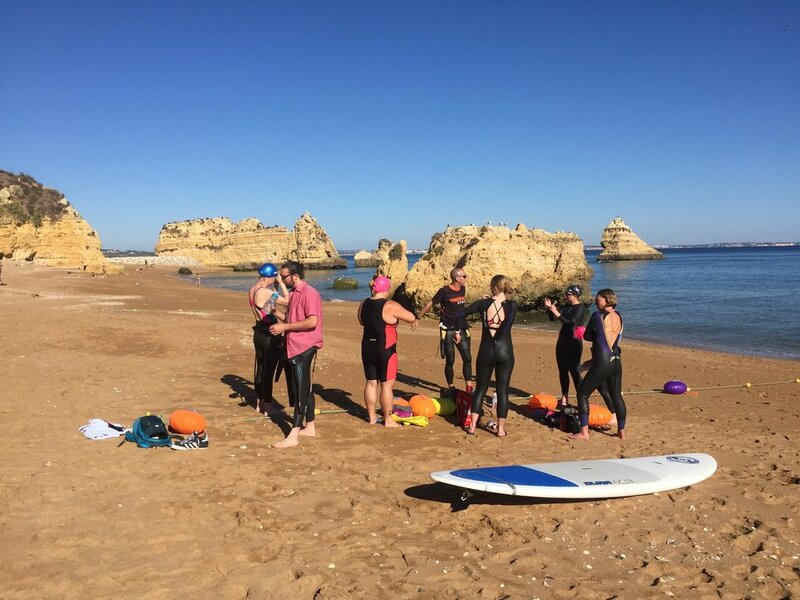 But hungover or not it was out the door for training every day, and the next day was an aquathlon, which I found hard not to call SwimRun, as that is all I know now when it comes to combining swimming and running these days. I haven't talked yet about how beautiful the beaches are, and the closest to us had "shark fin rock", which was a perfect natural buoy to swim around. A 350 m swim out and back with plenty of schools of fish out in the deeper water. The final day was a target run for the runners, with distances and times set based on personal goals, and a long ride and brick run for the triathletes. I went out on the ride, a 93 km ride up Mont Chique, one of the nearby hills inland from Lagos. I rarely ride this far so it was a decent test for the legs, especially with a couple of big climbs and time trials thrown in along the way. This was finished with a 6 km brick run alongside Jen. It is fair to say by Friday night I was completely exhausted, and then we went out. This week was all that and so much more, I didn't even cover all the little things, like the running technique session, the strength and conditioning, the nutrition, the training tips from the other coaches, and all the details of the great meals and fun stories in between. No doubt we'll be doing more with Embrace Sports going forward, and hopefully we can get a few more from Run With Me members on the trip in 2018!